So you started a blog for your company. You made a couple posts, shared them on social media, and then you waited. And waited… and waited some more. At this point, you’re probably wondering why you’re not getting the traffic, shares, links, or leads you anticipated. After all, you followed all the blogging best practices. Your content is interesting and unique, it’s not duplicated anywhere else, and it seems like something your customers would enjoy. So what gives? Sometimes, the success of a blog post has nothing to do with its content and everything to do with its circumstances. As the statistics in this post will show you, there are a few factors that can determine how many views, links, and shares your blog posts get — and how effective they are at converting your visitors into subscribers, fans, or business leads. Let’s examine seven different ways you can make your blog posts more successful, backed by data. On its own, a single blog post can thrive, receiving hundreds of links, shares, and comments. Or it may not gain any attention whatsoever, even if the content is good. Why is this? Research shows that the success of your blog — and your individual posts — might be affected by the amount you write. According to HubSpot’s Marketing Benchmarks report, companies that publish at least 15 blog posts each month get five times more website traffic than those that don’t, and also generate an average of 1,200 leads per month. Yes, this is a lot of work. Publishing a blog post nearly every other day requires constant work. But there’s a lot you could do with 500% more traffic. Consider this: if 15 blog posts a month leads to 500% more traffic, what do you think 10 posts would do? How about one post a week? Interestingly, the report also found that companies that publish blog posts just once or twice per month still generate 70% more leads than those who don’t blog at all. Essentially, no matter how much more you post, as long as you’re posting something on your blog, you’re going to see results. Whether these results come in the form of additional traffic, links, or new business may depend on your content. But the research shows that there are enormous benefits to scaling up your efforts, no matter what those efforts currently are. For marketers who have minimal exposure to search engine optimization (SEO), figuring out how and why Google ranks the content for any given search engine results page (or SERP) can feel like a guessing game. What makes your blog post on a topic rank lower than one that has less information or unique content? As you can see, based on the SERPs that were reviewed, the pages in the top three positions came in at an average length of about 2,450 words. Interestingly, there’s just a 400 word difference between the top two positions and the tenth. 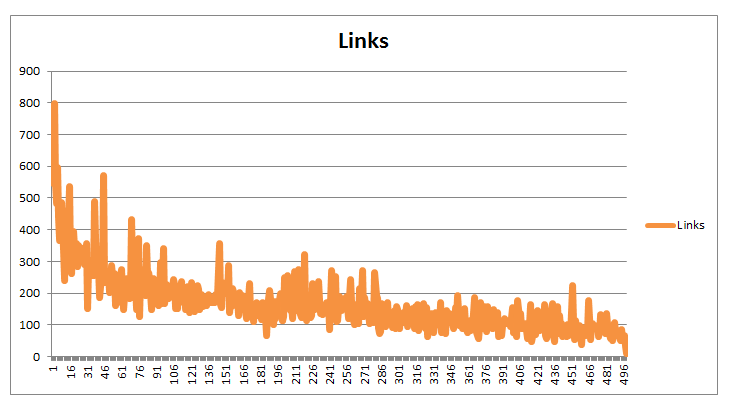 What this does mean is that for the specific SERPs analyzed, longer content just happened to be in the top spots. This may indicate that for some highly competitive searches, the best way to take the top few spots is to write more authoritative, interesting, worthwhile content — and this kind of content is often naturally longer and more in-depth. We already know that links are a ranking factor — that is, blog posts with more of them have a better chance at ranking higher. So it’s entirely possible that the combination of high quality content that just happens to be longer, and the higher link potential of longer content, comes together to produce the data shown in the serpIQ study. 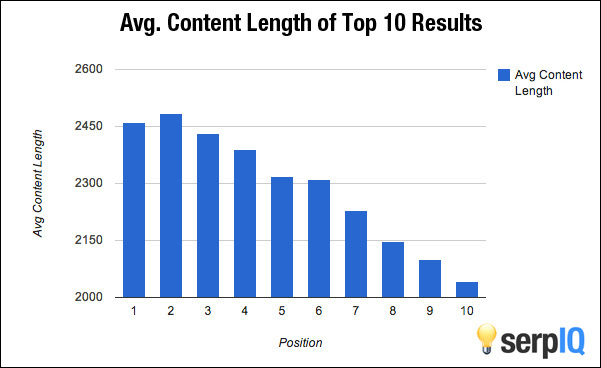 I know this is a lot to absorb, so here’s the takeaway: although your blog posts aren’t guaranteed to rank better if they’re longer, the data shows that you stand a much better chance at attracting links and outranking other sites if that content is both lengthy and high quality. So either a lot of office workers are slacking off by reading blogs on Mondays (more on the topic of blogging and productivity in a moment), or there’s another factor at play here. Having said all that, traffic isn’t the only measure of a blog’s success. You probably also count metrics like the number of links, social media shares, and comments when considering the overall success of a post. 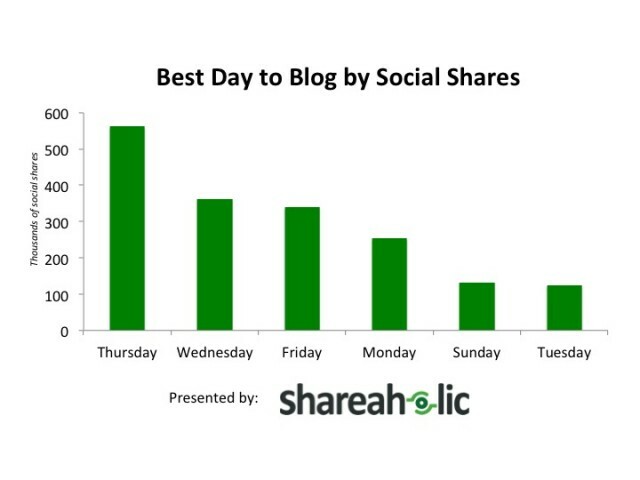 Additionally, research by Shareaholic found that more social media shares occur on Thursday than on any other day of the week. While this may not necessarily mean that you have to post on Thursday, it does indicate that content stands the highest probability of being shared and linked on a Thursday. Taking these last two points into consideration, it appears that if you want the most traffic, you should post on Mondays. If you want the most shares, post on Thursdays. The day of the week isn’t the only factor to take into consideration. 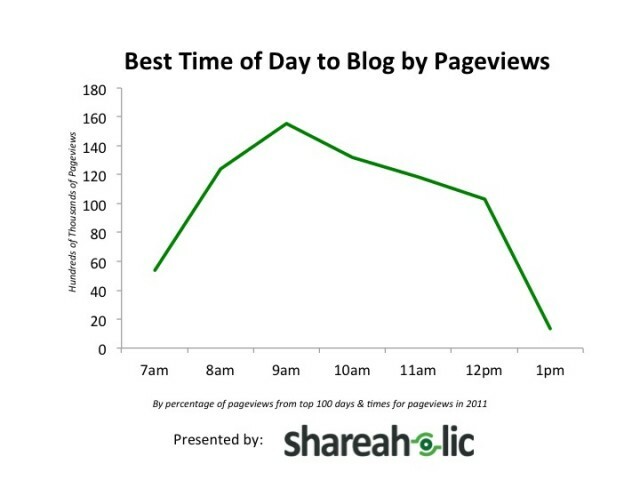 The time of day that you publish your new posts can also lead to a large difference in results. Shareaholic’s research also found that blog posts receive the most pageviews between 7 AM and 1 PM EST, with the sharpest peak occurring between 9 and 10 AM. This matches up to our findings on productivity, which show that office workers rate themselves as being the most productive between 9 and 11 AM. 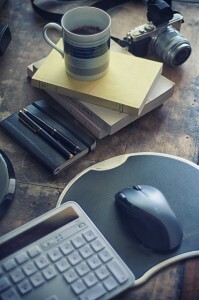 Of course, reading blog posts may not be seen as a productive activity in all workplaces. But if your job involves research in any form, or you rely on blogs and news articles to stay current with your marketing activities, these findings make sense. Although it’s unclear whether or not these links include social media shares or are limited only to links from other websites, the takeaway is still the same: your success rate may be higher if you schedule everything to take place during the beginning of the day. 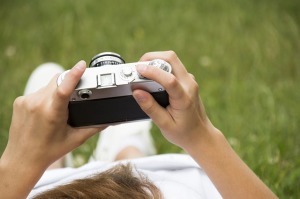 Are your blog posts filled with photos, illustrations, and videos, or are they heavy on text? Using images on your blog matters more than you might expect: research shows that articles with images receive 94% more views than those without. It’s easy to assume that including images makes a blog post easier to read, or keeps the attention of visitors longer. However, because this statistic applies to pageviews, it means that 94% less people will visit a page without at least one image on it. So adding images to your blog posts won’t just make them easier to read: it will also make them attract more visitors in the first place. Without images, you could actually be hurting your chances at appearing in any given SERP. Based on what you’ve just read, you may be thinking that the key to making your blog posts more effective is to post a ton of them, but only on Mondays and Thursdays around 9 AM, and only if they’re exactly 2,450 words in length and have a bunch of images included. Nothing could be further from the truth. Although this is certainly what the data suggests, these findings aren’t guaranteed to work for your blog. In fact, you might actually find that your blog posts get the most pageviews if they’re published on Wednesdays at 7 PM. Heck, most of Seth Godin’s blog posts are less than 300 words, and most of them are tweeted between 1,000 and 2,000 times. This is why it’s so, so important to test everything. Yes, this research reflects statistical averages and large data sets, but your audience may not be in line with those averages or findings. What your leads, customers, and potential readers want might be completely different than what everyone else wants. You should especially aim to test what you’ve been told is either a “sure thing” or “definitely doesn’t work.” For example, we don’t publish our posts on Fridays and Saturdays due to low traffic… but we’d never actually tried out those days. As it turns out, one of our most popular posts was published on a Saturday morning. It didn’t pick up links right away, but it also didn’t do any worse than the content we published on other days (including our favorite day, Monday). Creating a successful blog for your business isn’t easy. It takes time, hard work, and consistency. Without the right efforts, you’ll never reap the desired results. With the data presented in this post, I hope you have a starting point for improving your efforts (and doing a lot of testing). Although nothing can replace hard work and high quality, these factors may help you identify ways to get more traffic, links, or even leads from your posts, all of which can ultimately make a huge difference in the overall success of your business. Do you have any other tips for making a blog post more successful? Have you read any other data that you think could be helpful to new bloggers? Feel free to share in the comments!